A beautiful floral melody of sweet perfumy tropical flowers paired with rich Ylang and White Orchids! A strong, powdery fresh floral destined to touch your soul. Although it's floral, this intriguing scent is very fresh and clean. Certain to please if you enjoy florals. Very popular in our retail store. Teal/Turquoise color with slight undertones of yellow. 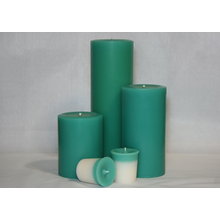 Our 6 Inch Hawaii Pillar burns approximately 200 hours. Our 9" Hawaii Pillar burns for 300 hours.